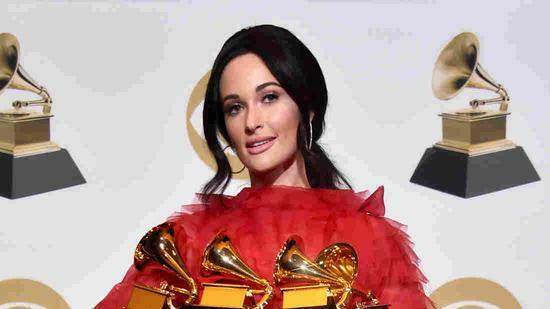 LOS ANGELES, Feb. 10 (Xinhua) -- American singers Kacey Musgraves and Childish Gambino took top awards at the 2019 Grammys held in Los Angeles on Sunday with four trophies each, making female acts and rappers big winners of the annual show. Musgraves from Texas won Album of the Year and Best Country Album for "Golden Hour," Best Country Solo Performance for "Butterflies" and Best Country Song for "Space Cowboy." "This Is America" is the first hip-hop Song of the Year winner in Grammy history. The song addresses the issues of gun violence as well as racism and discrimination against African Americans in the country. However, Gambino was a no-show at the ceremony to receive either of his awards, declining to perform on the biggest music night when invited by the Recording Academy. Lady Gaga and Brandi Carlile each picked up three wins. Best New Artist went to British pop singer Dua Lipa. Chinese American Artist Du Yun became the first female of color to be nominated for Best Contemporary Classical Composition in Grammy history with her piece Air Glow. Though she failed to grab the prize, which went to Aaron Jay Kernis for Violin Concerto, Du said the nomination was recognition enough for Chinese musicians by the U.S. music industry. "Whether or not I win the award, it's already a success for me and Chinese musicians in the United States," she said. Fifteen-time Grammy winner Alicia Keys hosted the show at the Staples Center. The annual Grammy Awards is presented by the Recording Academy to recognize achievements in the U.S. music industry.